A point-and-click adventure game, in which we assume control of the eponymous Detective Gallo – an anthropomorphic bird that attempts to solve the mystery behind the murder of five exotic plants. Detective Gallo is a classic point-and-click adventure game released by Adventure Productions. The PC version of the game was developed by Footprints Games, while MixedBag (the authors of Futuridium) is responsible for the console version. 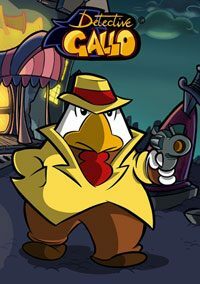 The story of Detective Gallo is heavily inspired by noir detective stories; nevertheless, the game maintains a lighthearted attitude achieved thanks to a healthy dose of peculiar humour. The game takes us on a journey to a noir town inhabited by anthropomorphic birds. The death of five exotic plants has led a local billionaire to offer a bounty to anyone that is able to solve the case. The case is picked up by a cynical Gallo, a detective and the protagonist of the story. The action of Detective Gallo is seen from a side-scrolling perspective. Our task is to lead the investigation – a mission which requires you to go through fifteen locations in search of needed items, as well as engage in riddles. Moreover, Gallo has to conduct conversations with neutral characters in order to learn more about the subject at hand and push the story forward. Interestingly enough, the protagonist often “breaks through the fourth wall” by directing his monologues at the player and making it known that he takes part in a video game. The game sports hand-drawn 2D visuals inspired by popular Disney cartoons. The events on the screen are accompanied by a jazz soundtrack. It should be mentioned that Nintendo Switch and Play Station 4 versions make use of their respective touch controls.